I love paper and these paper decorations, especially the paper cone Christmas trees. But that giant present and paper bag turkey are pretty fabulous too. This adorable Christmas spread is from a party that Frog Prince Paperie put together to celebrate the 25 Days of Grinchmas. I immediately fell in love with the paper cone trees. So I did a little searching to figure out how to make them. Turns out they are pretty easy to make! You just need to save some paper tubes from you wrapping paper or paper towels if you want them smaller. The smaller versions would even make a pretty great Christmas craft for kids! You can check out how to make paper cone Christmas trees over at Crafts for All Seasons. 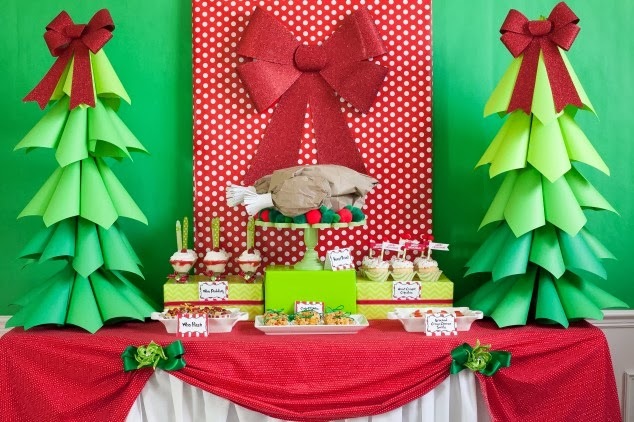 And you can check out the rest of this adorable Grinch themed Christmas party over at Frog Prince Paperie.